With the American occupation of the islands in February 1898, Legarda drifted away from the objectives Legarda drifted away from the objectives of his more radical counterparts in the revolutionary congress. War was bad for business, and he had a lot to lose if he backed the wrong side. 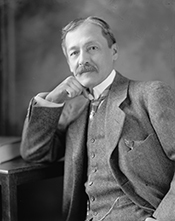 Legarda resigned from the Malolos congress, and returned to Manila where he found allies in United States General and military governor of the Philippines Elwell S. Otis and William H. Taft, the islands’ civil governor and future President of the United States. Since its creation at the turn of the century, the Philippine commission, which Legarda likened to the American Senate, functioned as an advisory board with legislative powers for the new Manila government. It was staffed by both U.S. officials and Filipino Federalistas sympathetic to America’s goals in the Pacific. Within a short while, Legarda had won the reputation as one of “the prestigious figures at the center of the party,” working to strengthen the relationship between the Philippines and the United States.9 In fact, according to one historian of U.S.–Philippine relations, Legarda was one of a handful of ilustrados who questioned the Philippines’ ability for “self-government” and “even advocated the indefinite continuation of American rule.”10 Legarda served on the commission for six years. Following his congressional service, Legarda spent the rest of his life away from the Philippines, working alongside Europe’s moneyed interests to bolster the islands’ agricultural bank, which he called “my life work.” On August 27, 1915, while in the town of Évian-les-Bains along Lake Geneva in western France, Legarda died suddenly. “It was as a brilliant scholar, charming gentleman and a financier of rare genius that Benito Legarda was known in many parts of the world,” the Manila Times eulogized. “It was Benito Legarda’s efforts which are said to have done more than any other thing to bring about peace between Americans and Filipinos in the days of the Empire and it was due in good part to his efforts that the American government was established here on such a firm foundation.”83 Legarda’s remains were buried in his native Manila. 1Congressional Record, Senate, 61st Cong., 1st sess. (14 June 1909): 3208. 2Quotation and family history from “Benito Legarda Called By Death in Paris,” 30 August 1915, Manila Times: 1; “El Hon. Benito Legarda, Fallecido en Paris,” 30 August 1915, La Democracia (Manila, PI): 1 ; Carlos Quirino, ed., Who’s Who in Philippine History (Manila, PI : Tahanan Books, 1995): 124–125 ; Benito Legarda Passport Application, No. 578, U.S. Passport Applications, Puerto Rico and Philippines, 1913–1925, vol. 2, Box 4233, National Archives and Records Administration, Washington, DC, www.ancestrylibrary.com (accessed 24 February 2016). 3G. H. Blakeslee, “The Gentlemen from Manila,” 18 January 1908, Harper’s Weekly: 14; Celestina P. Boncan, “The Philippine Commission, 1900–1916,” in Philippine Legislature: 100 Years, ed. Cesar P. Pobre (Quezon City, PI: Philippines Historical Association, 2000): 41. 4Frank H. Golay, Face of Empire: United States–Philippine Relations, 1898–1946 (Manila, PI: Ateneo de Manila University Press, 1997): 32; Peter W. Stanley, A Nation in the Making: The Philippines and the United States, 1899–1921 (Cambridge, MA : Harvard University Press, 1974): 44, quotation on p. 52. For a general discussion on the ilustrados, see Michael Cullinane, Ilustrado Politics: Filipino Elites Respond to American Rule, 1898–1908 (Manila, PI: Ateneo de Manila University Press, 2003): 26–35. 5Report of the Philippine Commission, vol. 2, Testimony and Exhibits, 56th Cong., 1st sess., S. Doc. 138: 387–388. 6Thomas F. Millard, “The Men Who Have Come to Washington to Represent the Filipinos,” 2 February 1908, Washington Post Magazine: 4; Stanley, A Nation in the Making: 64–65, 67; Cullinane, Ilustrado Politics: 29, 54, 57–58, 62; Boncan, “The Philippine Commission, 1900–1916”: 44 ; “Philippine Delegates to Congress Arrive,” 19 January 1908, San Francisco Chronicle: 17. 7Blakeslee, “The Gentlemen from Manila”; Report of the Philippine Commission, Vol. 2, Testimony and Exhibits: 176–182. See also Stanley, A Nation in the Making: 93. 8Stanley, A Nation in the Making: 72–73, 79; Boncan, “The Philippine Commission, 1900–1916”: 40–41; Cullinane, Ilustrado Politics: 69–70; “Dual Role in the Philippines,” 5 July 1901, New York Times: 1. For Taft’s remarks on Legarda, see “Special Report of the Secretary of War,” 23 January 1908, Annual Report of the War Department, 1907, vol. IX, 60th Cong., 1st sess., H. Doc. 2 (1908): 277. 9Stanley, A Nation in the Making: 116; Cullinane, Ilustrado Politics: 66; “Free Trade for the Philippines,” 20 January 1908, San Francisco Chronicle: 4. For more information on the Philippine Commission and its individual installments, see Boncan, “The Philippine Commission, 1900–1916”: 27–62. 10Golay, Face of Empire: 103. 11Stanley, A Nation in the Making: 119–123, quotation on p. 123. See also Cullinane, Ilustrado Politics: 105–106; Golay, Face of Empire: 114–115. 12Stanley, A Nation in the Making: 124, 127–128, 132–133. On the development of opposition parties and the fall of the Federal Party in the Philippines, see Cullinane, Ilustrado Politics: 73–143. For the rise of the Nationalist Party, see Cullinane, Ilustrado Politics: chapter 10. And for the new Progressive party, see Cullinane, Ilustrado Politics: 294–304. 14“Legarda One of The Delegates,” 7 November 1907, Manila Times: 1; “Legarda is Chosen to Go to Washington,” 16 November 1907, Philippines Free Press: 1. 15“Our Cosmopolitan Congress,” 26 November 1907, Washington Post: 6. 17Journal of the Philippine Commission, Inaugural Session, vol. 1 (Manila Bureau of Printing, 1908): 115, 120, 358–370, www.hathitrust.org (accessed 18 February 2016). 18“Delayed Departure,” 26 November 1907, Manila Times: 1; “Resident Delegates,” 13 December 1907, Manila Times: 1. 21“Legarda’s Straight Talk,” 28 February 1908, Cablenews-American (Manila, PI) : 2. 22“Legarda’s Straight Talk”; “Commissioners Leave Tonight,” 20 December 1907, Manila Times: 1. The trade bill was Public Law 58-114, 33 Stat. 181 (1904). 24Millard, “The Men Who Have Come To Washington To Represent the Filipinos”; “Legarda Offends Some Assemblymen,” 28 February 1908, Cablenews-American (Manila, PI): 3; “Filipino Makes A Practical Plea for Independence,” 17 March 1912, St. Louis Post Dispatch: 10. 25‘We Will Do Our Duty,’ Says Legarda,” 20 December 1907, Manila Times: 9. 28“People Met in Hotel Lobbies,” 28 January 1908, Washington Post: 6. 29“Needs Interpreter in Congress,” 6 February 1908, New York Tribune: 7. 30Congressional Record, House, 60th Cong., 1st sess. (4 February 1908): 1540; “Commissioners From Philippines to Sixtieth Congress,” 13 February 1908, Los Angeles Times: 12; “They Get Rights There,” 14 March 1908, Cablenews-American (Manila, PI): 6. 31“Filipinos Urge Trade,” 14 March 1908, Washington Post: 3. 33Gus J. Karger, “Capitol Comment,” 17 February 1908, Times-Star (Cincinnati, OH): 4; “A Great Big Man,” 30 April 1908, Manila Times: 3. 35“Trade With The Dependencies,” 16 March 1908, New York Tribune: 6. 36Thomas F. Millard, “Philippines Not a ‘Problem’ Nor a ‘Burden,’” 23 February 1908, New York Times Magazine: 2; Thomas F. Millard, “Our Interests and Our Duty in the Philippine Islands,” 23 February 1908, Washington Post Magazine: 4; Thomas F. Millard, “Congress Holds the Key,” 23 February 1908, Chicago Daily Tribune: A1. 37House Committee on Ways and Means, Duties on Philippine Products Imported into the United States, 59th Cong., 1st sess., H. Rept. 20 (20 December 1905): 1, 3. 39“To Gather Revision Facts,” 1 May 1908, New York Times: 2. 40“Enthusiastic on Tariff,” 5 May 1908, Cablenews-American (Manila, PI): 1; “Island Help Planned,” 1 May 1908, Indianapolis Star: 2; “To Gather Revision Facts,” 1 May 1908, New York Times: 2; “Legarda-Payne Tariff Bill Up,” 7 May 1908, Cablenews-American (Manila, PI): 1. 41“Legarda-Payne Tariff Bill Up”; “Contents of Legarda Bill,” 9 May 1908, Manila Times: 1; “How Legarda Has Amended the Payne Bill,” 9 May 1908, Cablenews-American (Manila, PI): 6. For more information on H.R. 21449, see Abelarde, American Tariff Policy toward The Philippines: 92–95. 42Hearings before the House Committee on Ways and Means, H.R. 21449: Philippine Island Tariff, 60th Cong., 1st sess. (5 May 1908): 225–232. 43House Committee on Ways and Means, Philippine Tariff Laws, 60th Cong., 1st sess., H. Rept. 1607 (4 May 1908). 44“Enthusiastic on Tariff”; “Legarda-Payne Tariff Bill Up”; “Contents of Legarda Bill”; “How Legarda Has Amended the Payne Bill”; “El bill Legarda-Payne,” 12 May 1908, La Democracia (Manila, PI): 1. 45Congressional Record, House, 60th Cong., 1st sess. (27 May 1908): 7094. 46Ibid., 7097 ; “Payne-Legarda Tariff Bill Passes The House,” 29 May 1908, Manila Times: 1; “Railroad Gets Extension,” 28 May 1908, Washington Post: 4. 47Lewis L. Gould, The William Howard Taft Presidency (Lawrence: University Press of Kansas, 2009): 11. 48“For the Payne Bill,” 1 April 1909, Boston Daily Globe: 9; “House to Hasten Tariff Revision,” 1 April 1909, Chicago Daily Tribune: 2; “Tariff in the Philippines,” 1 April 1909, Los Angeles Times: 11. 49Congressional Record, House, 61st Cong., 1st sess. (3 April 1909): 929–930. 50“A Filipino Heard,” 3 April 1909, New York Tribune: 2; “Test Vote Monday,” 3 April 1909, Washington Post: 1; “House Debate Goes On,” 4 April 1909, New York Times: 2. 51Congressional Record, House, 61st Cong., 1st sess. (3 April 1909): 929–930. 52Ibid., 930. See also “House on Monday to Ballot on Hide and Lumber Tariff,” 3 April 1909, Christian Science Monitor: 1. 53Congressional Record, House, 61st Cong., 1st sess. (3 April 1909): 931. 54“President Wins Point for Philippine Sugar,” 10 April 1909, Los Angeles Times: I12; Hearings before the House Committee on Ways and Means, Philippine Tariff Bill, 61st Cong., 1st sess. (20 April 1909): 44. 55Quotation from “Message by Taft Demands Bill for Philippine Trade,” 15 April 1909, Christian Science Monitor: 1. See also “Tariff Revision for Philippines,” 16 April 1909, Atlanta Constitution: 2; “Taft Submits Bill for Insular Tariff,” 16 April 1909, New York Times: 3; “Tariff Message from Taft Today,” 15 April 1909, New York Times: 3; “Free Trade in Philippines,” 15 April 1909, Baltimore Sun: 2. 56“New Tariff for the Philippines,” 16 April 1909, San Francisco Chronicle: 3; “Trade With the Philippines,” 17 April 1909, New York Times: 8; “Low Rates for Philippines,” 21 April 1909, New York Times: 1; “Beveridge to Lead New Subcommittee,” 27 April 1909, Indianapolis Star: 1; House Committee on Ways and Means, Philippine Tariff, 61st Cong., 1st sess., H. Rept. 7 (10 May 1909): 1. 57“New Philippine Tariff,” 16 April 1909, New York Tribune: 2. 58Congressional Record, House, 61st Cong., 1st sess. (13 May 1909): 1998; Philippine Tariff Bill: 17, 32, 47. 61Philippine Tariff: 2; “Tariff Shadow Over Congress,” 10 May 1909, Atlanta Constitution: 2; “Duties for Filipinos,” 12 May 1909, Washington Post: 5; “New Philippine Bill,” 11 May 1909, Baltimore Sun: 2; “Philippine Bill Reported to House,” 11 May 1909, Wall Street Journal: 3. 62“Filipinos Want Freedom,” 13 May 1909, Baltimore Sun: 2; “Duties for Filipinos,” 12 May 1909, Washington Post: 5. 63“The Future of the Philippines,” 3 April 1909, Christian Science Monitor: 14; “Ocampo for Protest,” 13 May 1909, Washington Post: 4. 64Congressional Record, House, 61st Cong., 1st sess. (13 May 1909): 2000. 65“Philippine Bill Up,” 14 May 1909, New York Tribune: 2; Congressional Record, House, 61st Cong., 1st sess. (13 May 1909): 1997–2012. 66Congressional Record, House, 61st Cong., 1st sess. (13 May 1909): 2002, 2005. 67Congressional Record, House, 61st Cong., 1st sess. (17 May 1909): 2126; Congressional Record, House, 61st Cong., 1st sess. (20 May 1909): 2237. 68Congressional Record, House, 61st Cong., 1st sess. (24 May 1909): 2238. 69“House Completes the Philippine Tariff Bill,” 3 August 1909, San Francisco Chronicle: 2; “Pass Philippine Bill,” 3 August 1909, Washington Post: 1. 70“Party Pledges Fulfilled Says Taft, of Tariff Bill,” 6 August 1909, Detroit Free Press: 1. 71“Taft Signs Tariff Bill,” 6 August 1909, Detroit Free Press: 1. See also “Tariff Bill Now a Law,” 6 August 1909, Baltimore Sun: 1. 72Abelarde, American Tariff Policy toward The Philippines: 100–109. 73“Legarda and Quezon Chosen,” 15 May 1909, Manila Times: 1. 74“Filipinos Envoys Here,” 29 December 1909, Washington Post: 4; Stanley, A Nation in the Making: 181–182. 75Hearings before the House Committee on Insular Affairs, H.R. 32004, 61st Cong., 3rd sess. (26 January 1911): 6. 76Hearings before the House Committee on Insular Affairs, Administration of Civil Government in Philippine Islands, Part 2, 61st Cong., 3rd sess. (26 January 1911). 77“French to Finance Big Philippine Bank,” 20 July 1911, New York Times: 4. 78“French Bank in Philippines,” 21 July 1911, New York Times: 11. 79Congressional Record, House, 61st Cong., 3rd sess. (6 February 1911): 2022–2024; Public Law 61-376, 36 Stat. 910 (1911). For more information, see Philippine Legislature, Election of Resident Commissioners to the United States, 2nd legislature, 1st sess., Document No. 250—A. 38 (Manila : Bureau of Printing, 1911), https://archive.org/details/aqw4348.0001.001.umich.edu (accessed 10 February 2016). 80“Tavera Vice Legarda Is Rumor,” 8 November 1912, Manila Times Weekly Edition: 8. 81“The Week and the Outlook,” 22 November 1912, Manila Times Weekly Edition: 1; Stanley, A Nation in the Making: 168–169. Papers: In the William Howard Taft papers, ca. 1784-1973, 676,000 items ; 1,562 containers plus 8 oversize ; 902.5 linear feet ; 658 microfilm reels. Correspondents include Benito Legarda. "Benito Legarda" in Asian and Pacific Islander Americans in Congress, 1900-2017. Prepared under the direction of the Committee on House Administration by the Office of the Historian and the Office of the Clerk, U.S. House of Representatives. Washington; Government Publishing Office, 2018.